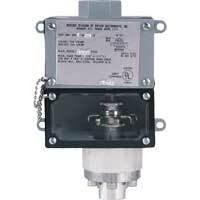 Customers tell us that the SERIES DA/DS are the best pressure switches made. 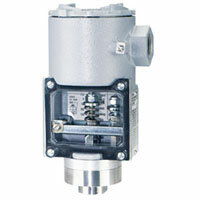 The Mercoid DA/DS Series is one of the world’s broadest lines of pressure switches. 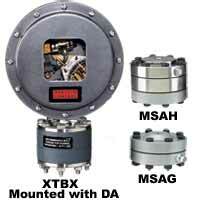 The DA/DS Series has extremely high sensitivity and great repeatability. The DA Models are equipped with two external adjustments, one for setting high pressure operating point, the other for setting low pressure operating point. Deadband, the difference between high and low setpoints, is adjustable over the full-scale. The DS Models are equipped with a single external adjustment for setting operating point only. For mercury-free switches, choose between the snap action switch or hermetically sealed snap action switch. 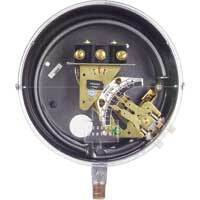 Hermetically sealed mercury switch also available. Brass, 403 SS, or 316 SS. Maximum pressure of the operating range. General purpose, weatherproof or explosion-proof. ±1% of full operating range, ±1.5% on DS-7300 models. SPST mercury switch, SPDT mercury switch, SPDT snap switch, or SPDT hermetically sealed snap switch. Other circuit types available. General purpose: 1/2" hole for conduit hub. Weatherproof: 1/2" conduit hub. Explosion-proof: 3/4" female NPT. General purpose and weatherproof: 1/4" male NPT; 1/2" male NPT on range 15S and 16S. Explosion-proof: 1/2" male NPT and 1/4" female NPT. General purpose: 4 lb (1.8 kg). Weatherproof: 6 lb (2.7 kg). Explosion-proof: 8 lb (3.5 kg). Explosion-proof Enclosure (Series DAH): Suitable for Class I, Groups C and D; NEMA 7; Class II, Groups E, F, G; Class III NEMA 9 and 9A, Division 1. Add "H" to model number after DA or DS. Example: DAH-31-153-7. FM Approved: For general purpose and explosion-proof models see Agency Approvals on Specification page. Add "F" to model number after DA, DS, DAH or DSH. Examples: DAF-31-153-7 or DAHF-31-153-7. Other Options (consult factory): DPDT switches or other switch types, fixed deadband mercury switch units for low deadband applications, manual reset operation, two-stage operation, acetal bushed movement for applications with high amounts of vibration and/or pulsation, fungus proofing, siphon, diaphragm seals, mounting flange and remote connection. Weatherproof Enclosure (Series DAW): Add "W" to model number after DA or DS and change 1 to 3. Example: DAW-33-153-7. 2 15S range 500-5000 psig, type 403SS Bourdon tube, not avail. with housing E or back conn.
2 16S range 800-8000 psig, type 403SS Bourdon tube, not avail. 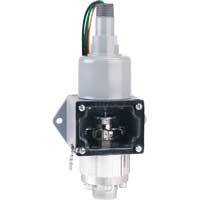 with housing E or back conn.
35(4)(5) 8N range 250 to 415°F, 550°F max., 304 SS bulb and capillary std. 35(4)(5) 9N range 350 to 550°F, 600°F max., 304 SS bulb and capillary std. 35(4)(5) 11N range 100 to 500°F, 600°F max., 304 SS bulb and capillary std. 36(4)(5)(10) 5NS range 100 to 200°F, 300°F max., 304 SS bulb std. 36(4)(5)(10) 6NS range 140 to 250°F, 380°F max., 304 SS bulb std. MOUNTING OPTIONS 37(4)(5)(11) Same as 36 except back connection, 304 SS bulb std. (1) Not available on D_ _-_5, 74 or 95. (2) Available on DA only. (3) Not available on D_ _ _-70_ _. (4) & (5) Not available with 9, 92, 95 Diaph. Seals. (6) Available also as _ _ 28, 58, 708 and 728. 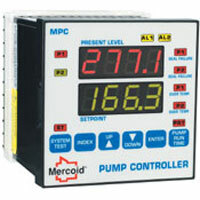 Not available with E or H housing or 70-804 circuit. (7) F available only as DAF, DSF, DRF, DAHF, DRHF, DSHF, not all ranges or circuits. (8) Switch rating for D-400: AC, 120V @ .3A, 240V @ .15A, 24V @ .8A, DC, 120V @ .15A, 240A @ .07A. Not available for 440V service. (9) Available only as _ _39, 539, 239, 7039, 7239, 439 and 7439. (10) Available only as _ _36, 7036 and 7236. (11) Available only as _ _37, 7037 and 7237. (12) Available only on 702, 703 and 704. (1) -153 circuit available 1A 440V AC on special order. (2) Also rated 0.9A at 24V AC. (3) 1/4 HP at 120V AC, 1/2 HP at 240V AC. 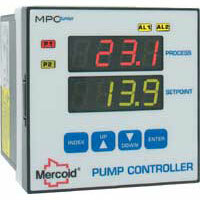 (4) DC rated controls (up to 10A. (5) 5A, 30V DC resistive. (6) 17A non-inductive at 120/240/440V AC.